Let’s set the tone by stating that I am not going to tell you to do the work yourself, nor to buy all of your materials second-hand. What I’m discussing is how to make your normal, run-of-the-mill remodeling project cheaper. The assumption is that you will be employing a remodeling contractor to do the job, and that you won’t be getting your materials off of Craigslist. And that’s OK — there is no reason to be ashamed. DIY is OK for people who have skills and time. Since I personally struggle to find time to vacuum once a week (let alone remodel my bathroom), I understand the need to have someone else do the work, and to shop for materials in the quickest way possible. My first piece of advice is: Don’t scrimp on labor costs. The smallest quote for the job might look attractive, but you might end up paying more in the long run. You are better off buying less expensive materials and paying more for labor, than vice versa. (I am talking decent stuff versus luxury stuff; I do not mean sacrificing the quality of materials.) If you have a cheap, not-so-great contractor install your luxury materials, his work might need to be redone, or worse — he could damage your materials. Invest in good labor, and you’ll pay less down the road. The work will be durable, and you will not need to pay someone else to correct it. My second piece of advice is: Find good alternatives to super-duper-luxury materials. 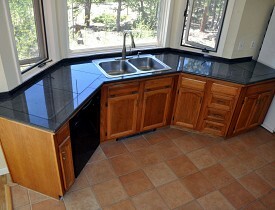 Granite slab counter tops are not 100% necessary. Brazilian Cherry floors are nice, but white oak looks great, wears well, and costs less. If you want to cut the cost of a remodel, look for alternatives to luxury materials like granite slabs. For example: One of my favorite Denver tile contractors suggests installing a granite tile counter top instead of a granite slab counter top. The results look equally beautiful, but the cost of installing large granite tiles instead of a granite slab is about half. My third piece of advice is: Buy off-the-shelf fixtures, but go custom on the installation. While custom-built cabinets, bookshelves, and vanities are attractive, you might get more bang for your buck by having a great carpenter install prefabricated versions of these things. Unless you are dealing with an oddly-shaped space, you can save a lot of money on labor and materials by opting for factory-made fixtures, rather than building custom. As long as you choose high-quality fixtures and your carpenter installs them well, they should be durable and attractive for years to come, and nobody will notice that you didn't custom-build them. The bottom line is, if you want to save on remodeling projects, save on materials but don't scrimp on labor costs. Have the best contractor you can find install good-but-not-luxury materials, and you'll have a remodel that will serve you well.